School District 7 having a Kindergarten Admissions Fair on Wednesday, February 6, from 6:00 pm to 8:00 PM at P.S. 5 Port Morris (564 Jackson Avenue). The fair will provide families with information about the District 7 kindergarten admissions process and the various school options within the district. The District 7 Fair provides a great opportunity for students and their families to meet with potential schools. 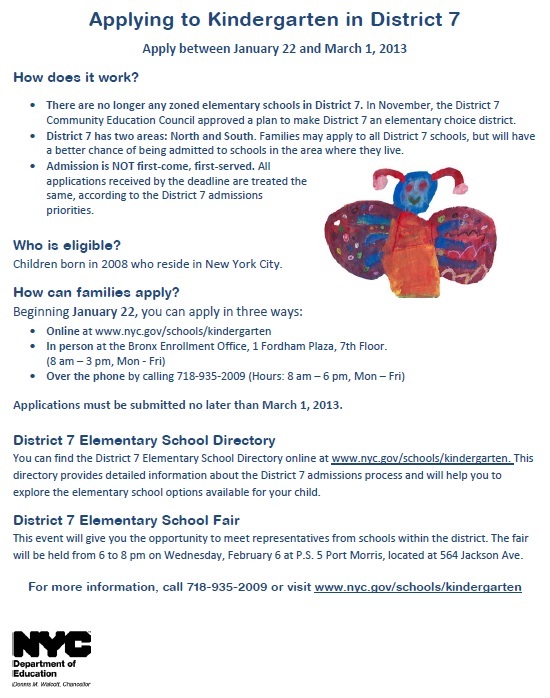 Families can pick up the District 7 Directory at any public elementary school in District 7 or at the Enrollment Office (1 Fordham Plaza, 7th floor). We also have it available here in English and here in Spanish.